Wesley Snipes has announced that he, artist Mshindo I and Gregory Walker (Brother G) are launching an animated science-fiction project called Zulu Mech 1. The basic premise of the series is that our world is a near-utopia with Africa being a prosperous united superpower when it is invaded by a race of strange highly intelligent creatures from deep within the Earth. 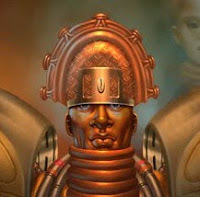 They wreak havoc in their quest to return the Earth to it's state before the dawn of humanity until a South African family, named Mthunzi, develop a hero called Zulu Mech 1. Gregory Walker, co-creator is also the writer of the acclaimed "Shades of Memnon" epic. Welsey Snipes will serve as one of the voice actors and producer. "I think the world will be just as pleased as I was when Brother G and Mshindo brought this ground-breaking adventure series to my attention," said Snipes, who starred in the Blade trilogy. "Everybody knows I love sci-fi and there is really nothing like it on the market. Zulu Mech 1 can easily stand next to other epics like Star Wars on the strength of the story telling alone. But when you consider that it brings a fresh, untapped perspective to sci-fi, that really makes it hot." In addition to the online videos, they plan to launch a line of video game, toys, limited edition art and other merchandise that will all be designed by Mshindo. The series is set to launch at the Book Expo America African American Pavilion in New York on May 30th. HEROTALK v2 :: View topic - Zulu Mech 1 news: Wesley Snipes speaks and the ZM1 poster! That looks freakin' sweet. South African sci-fi...nothing else like it, indeed. About time they showed that it's not Asians and Americans who can make giant robots. I look forward to the Eskimo mech series as well. But I hope Wesley Snipes remembers to pay his taxes this time. Who Are in the New Transformers Movie?